Indian director Tarsem Singh’s new 3D adventure epic Immortals starring Henry Cavill, Freida Pinto and Mickey Rourke opened at number one at the North American box office on Friday, November 11, with an estimated $15M in ticket sales for Relativity Media exceeding expectations and leading all films in the marketplace. Singh has become part of a very short list of Indian-born filmmakers to top the U.S. box office multiple times. His fantasy thriller The Cell also opened at number one in August 2000. For Pinto, Immortals marks her second top spot debut of the year following her sci-fi pic Rise of the Planet of the Apes from August which has grossed more than $450 million worldwide to date. Singh’s stylish Greek mythology-inspired epic Immortals beat out the combined grosses for the two other new films on Friday including Adam Sandler’s latest comedy Jack and Jill which opened to an estimated $10 million as well as director Clint Eastwood’s new biopic J. Edgar starring Leonardo DiCaprio which debuted with an estimated $4.3 million. 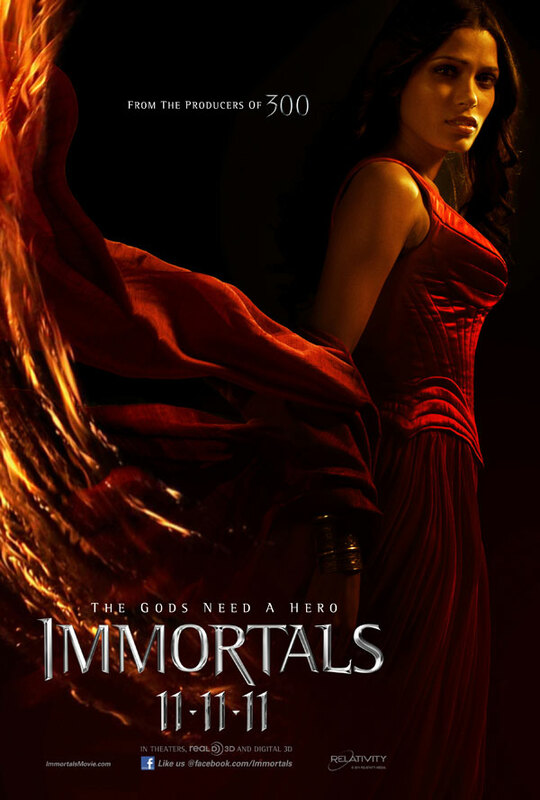 Immortals also generated the third biggest opening day of the year for any R-rated film, and the best among non-sequels. 17 queries in 0.639 seconds.